This entry was posted in Connecting with Community, Food Glorious Food, Going Green, Making, Creating + Frugal Living and tagged beef, cooking, eco friendly, environmentally friendly, feather and bone, food, how to, live animal export trade, meat, steak, sustainable by cityhippyfarmgirl. Bookmark the permalink. It’s not easy Mrs Bok, and it does take time in researching all the available options. Good luck with your continued buying. Looks beautiful. I think those things have a temporary effect, but people have an appetite for meat so long-term changes… well, we’ll see. Four Corners have certainly stirred up something of a hornets nest with that program – and I’m pleased about that. There is a great deal more interest now in ethically produced meat. I really hope it continues Amanda. I like your philosophy around purchasing. It has come to the forefront of late and I hope more people start to think about the process too 🙂 We’ve become more aware of fruit and vegetables, and organic food in general, so it seems like meat purchasing should be starting to catch up too. I”m sure it tastes better as well! Magnificent looking steak! I think you’re absolutely right, and we all need to be making more informed decisions about what we eat. Of course, every person needs to find their own line in the sand, but I reckon we should try and do that with as much information in hand as we can. Yep, you are right. People do need to find their own line and be prepared too for that line to change, whether it’s forwards or backwards given their circumstances. I haven’t heard of this place, but I should pay them a visit. Good meat is expensive, but that is for a reason. Sign up for their email Richard, it lets you know whats on offer for the week. PS I don’t eat steak either (no red meat actually) but I reckon the Geege would think all his Christmases had come at once with that slab of steak! We eat less meat around here too, which offsets the higher cost of farmer’s market meat. I learned the other day that farmer’s market grass fed beef has way more omega 3s and 6s in it, than the grain (corn) fed beef that is the standard. 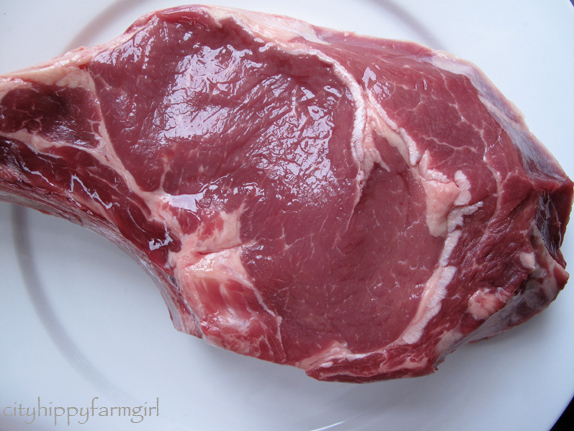 Plus a T-bone steak from corn fed beef has 9 grams of fat, compared to a free range grass fed equivalent, at 1.3 grams. Free range, grass fed is the way to go! Where I live bison is available, so I have been opting for that instead of beef. I can understand the weight of your steak, but it sounds like you bore it successfully! I eat very little meat for economic and provenance reasons, and think that in the future meat will become more expensive and this way of eating will become more normal again – as it used to be when families would have a roast on a Sunday and then make the remains last the next few days too. I think that is an Italian breed of animal. I certainly see them there. I haven’t bought meat from a supermarket (or any other type of fresh food) for years. We don’t eat as much meat as we used to. If I had to kill it myself I would most definitely be a vegetarian. The 4 Corners programme has certainly made people sit up and take notice. Let’s hope there are lasting good results. Wow, totally wasn’t expecting that fantastic meaty picture when I opened your post. I love that you came home with a steak, and not just any steak mind you… A man sized steak. Oh how I’d love that piece of meat right now. (Im not being dirty if that sounds at all dirty). And good on you buddy, your a steak cooking extrodinare, and how lucky is Mr Chocolate, super sweet too. proud of ya sista. Im off to the kitchen to pop a giant piece of meat on the shopping list. You’ve inspired me. growing up on a farm i got to experience first hand how the lamb got from the paddock to the plate, from a young age. i think if all meat eaters spent some time in a slaughter house, many would rethink their choices. these days we mostly limit red meat to weekends. primarily for health reasons. What a rewarding post for a beef cattle farmer who cares about her animals to read. We really have been encouraging everyone we know to buy things you know the origin of…. even know the farmer. 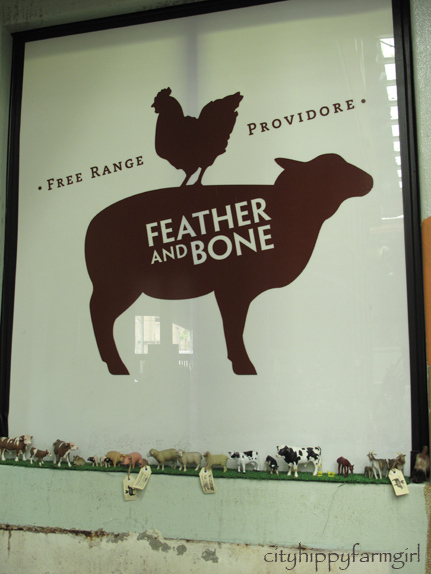 In our area we would like to get a few people who are buying meat from us after we have it done at our local butcher. They get to see how well our animals are cared for and what we feed them. 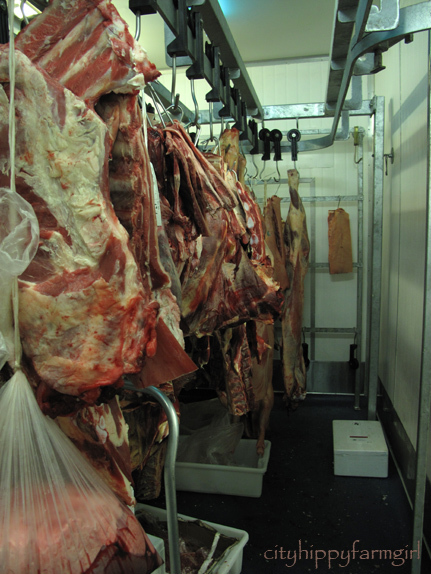 For people in the city , there may just be a producer an hour or so away who when approached would really be happy to do a bulk order for them….or simply find a really great butcher like you have . It works out for the farmer too , we like to know where the things we produce are going. The fact that people who care about humane and sustainable farming are out there is a good thing for farmers too. Most small scale farmers would prefer to work in a system like this, it is just a matter of people finding us and interacting with us. Thank you for Kim, for taking the time to write that. I’m always really interested when a farmer weighs in for a different perspective. It is simply wonderful to read your experience with our beef, makes us smile. Say hello to Mr Chocholate and tell him in Tuscany (where Chianina is the local breed of cattle) the steak would have been referred to as a “bistecca alla fiorentina” and served with white Canellini beans and a glass of Chianti. Here’s a link to how it is traditionally served. Sam and Daniela thank you so much for taking the time to comment and post that link. I just showed Mr Chocolate and he declared he was hungry. Your website looks wonderful and it just reinforces to my why I do want to make these careful purchasing choices when buying meat. Thank you.